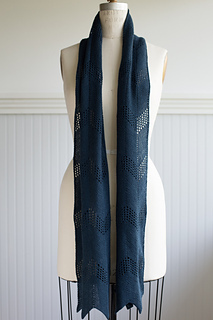 This pattern is no longer available for free. On August 23, 2018, it has been enhanced and available for purchase with updated instructions, new options, and photography by the talented Jared Flood.“ The new enhanced pattern version can be found here for purchase. 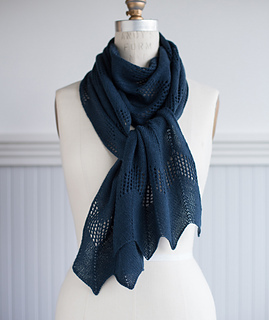 The Chevron Lace Scarf celebrates the 2018 Puget Sound LYS Tour, alternates arrowing panels of nearly sheer stockinette and gauzy eyelet lace. The peaks and valleys draw your eyes along the length of the scarf, which ends in gentle zigzags. 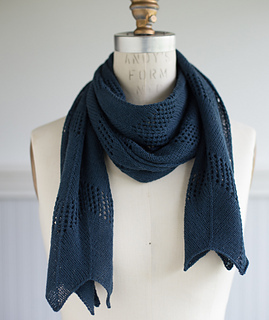 Brooklyn Tweed’s laceweight Vale makes a Chevron Lace Scarf that’s light and lofty, soft and springy. This 2-ply fiber is worsted-spun from pure Wyoming-grown Ramboulliet fleece (similar to merino wool, but with more bounce). 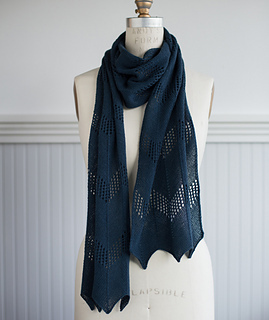 Specially developed for superior lacework, Vale is victorious in both the eyelet stitches and simple stockinette of this scarf—such crisp stitch definition! Approx. 10” x 78”/23cm x 198cm, after blocking. 2 skeins Brooklyn Tweed Vale (450 yds/411m each). Or approx. 900 yards of equivalent lace-weight yarn. US 4 needles, or size needed to obtain gauge. Blocking wires (recommended) and T-pins. 32 sts = 4”/10cm in stockinette chevron pattern on US 4 needles, or size needed to obtain gauge, after blocking.